After a long and miserable life, Charles II of Spain was died in 1700. Even though the two sides (France, Holy Roman Empire) and other European powers made treaties about the partition of the Empire several times, but the local administration did not accept them. After the death of the king they offered the crown to the French side and the casus belli created in no time. The maritime powers (sometimes referred as “Grand Alliance” consisted of England, from 1707 Great-Britain and the Dutch Republic) and the Holy Roman Empire formed an alliance versus the French-Spanish coalition, who were joined by the Bavarian leader Maximilian Emanuel. 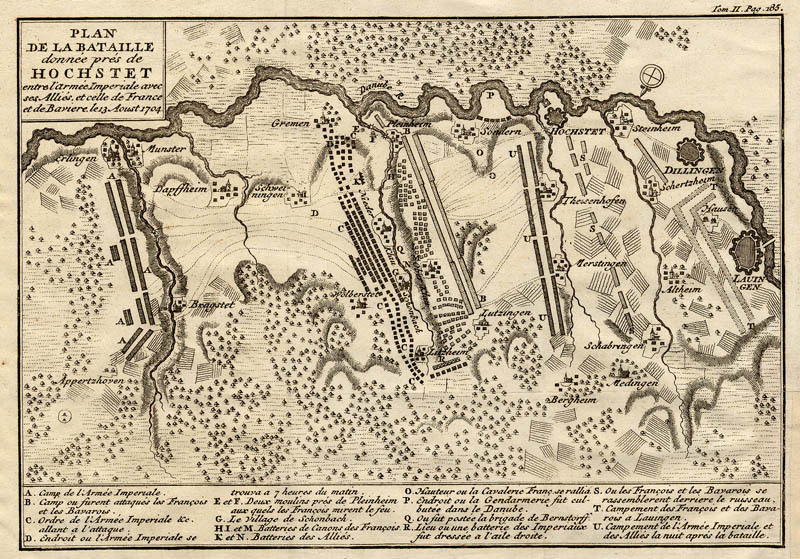 The campaign of 1704 consisted two major parts: the “March to the Danube” and the exact battle of Blenheim in August. The logistical masterpiece of 1704 was the March itself. They transferred nearly 20 thousand troops using 1700 carts, five thousand animals to transport. Marlborough’s men paid for the campaign ahead of the army buying clothes, food and other supplies so the soldiers had to march only. The logistical success provided the strong basis to the upcoming battles. Marlborough later joined Louis of Baden near Ulm and sent Eugene of Savoy to check on Villars’s position. As they found out about a small contingent of Bavarian troops near Schellenberg Marlborough decided to attack (2nd of July). In this small fight the British troops suffered heavy casualties (five thousand men), although the Bavarians lost twice of that number and fifteen guns. After the battle Marlborough tried to get in touch with Eugene, whose task was to watch the French movements. His army was nearly two times smaller than his counterparts so he retreated from Höchstädt to Blenheim to wait for Marlborough. Although the Allied forces had to upper hand by mobilizing first, the French had the tactical and numerical advantage. Tallard – who followed Marlborough from the Netherlands to the Danube – was sure, that he could corner the British Lion into a cage of the Bavarian forest. Marlborough surprised his advisors and partners by ordered to join ranks with Eugene and left Louis of Baden behind with the assault of Ingolstadt. We can see that the tactical decision was made on the French threat: the Allied high command was afraid they would be locked from the Danube, which was the main supply line for them. Many historians pointed out that Marlborough had nearly no choice but fight: he had to prove results – otherwise he would be moved from his position as leader of the Allied army. But he did not accept the classic ways of war: he risked everything on the line and prepared to attack. 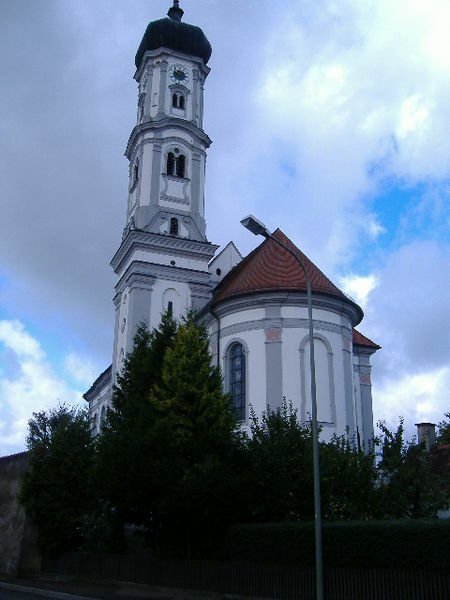 On 12th of August Eugene and Marlborough climbed the church tower in Tapfheim to watch the French-Bavarian positions. The sources said after this Marlborough had a clear vision about the enemies intentions and pulled a plan out of his pocket. As they marched to Blenheim (sometimes called Blindheim) the Allied army were divided into two major groups. Eugene was about to take the lead the right flank and Marlborough was left with the task to crush the enemy’s centre near Blenheim. On the other side the French-Bavarians were on a pause and waited on Marlborough to act. In a strategic view they only had to hold their lines as the end of the military season approached. Without provision and supplies the combined Austro-British would be crushed and Vienna should fall into their hands. As we saw in the beginning the master plan of the 1704 campaign relied on the deceive blow to the French Armies and save Vienna from any threatening. As we mentioned before the Allied forces were divided into two separate groups (Marlborough in the centre and left, Eugene on the right flank). What about the French-Bavarian battle plans? They relied their positions on both cultural and natural barriers. Their forces and command were cut between three commanders: Tallard (controlling the campaign and the French armies by his name), Marsin (leading a large portion of cavalry) and the Bavarian Maximilian Emanuel. They stationed the army focusing on towns and hills, but the control became isolated as the first shots were fired. Tallard leaded the right and centre (mostly with cavalry) and joined forces of Marsin and Emanuel defended the left flank. French-Bavarian forces: 84 battalions (infantry), 147 squadrons (cavalry), 90 cannon. App. sixty thousand men. Allied forces: 66 battalions, 160 squadrons, 66 cannon, app. fifty-six thousand men. We can see the difference between the armies, as the Allies had a slight advantage in cavalry and the Frenchs greater infantry. The latter explains why the French had occupied the major towns of the battlefield (Blenheim, Lutzingen, Oberglau) – they had enough numbers to do that. The only disadvantage the French-Bavarians had related to the cavalry: not only they lacked the numbers, the horses were infected with disease and were unable to fight. The personnel had to serve on foot – some historian said they became dragoons but this is mere a concept, because they lacked the training and this backfired during the battle. The main Allied battle plan lied on Marlborough: he ordered Eugene to attack and pin down the French’s left flank in order to draw away the reinforcements. Then the combined Allied forces (middle and right flank) would deliver the deceive blow and finishing the battle. The first British troop leaded by Rowe were on their way on Blenheim – the French troops saw them by surprise as the fog mist disappeared by the morning wind. The battle was about to start to “change the fate of Europe”. Attack on Blenheim – a Magician’s code? We can read a perfect summary of the battle in many books like Churchill, nowadays by Falkner. I would like to give you a little summary and focus on the most interesting parts of this incident. I have to point out that this battle was quite atypical. In the 17th century, wars would go for years without major battles, manoeuvring and attacking food supplies and making peace treaties. If a battle was about to start the leader would assemble his troops like the following. We can see the infantry would be the centre of the army and the cavalry were found on the sides. Cannons were found between the ranks of the infantry or in front of them, but we can find evidence of moving them into batteries. In attachment X we can see the shortcut version of the battle. It seems actually simple: the Allied troops attacked the towns made the French send their reinforcements into that area. After the mostly British and Hessian centre broke through the weakened French centre and cut their in half. Later they turned their attention to the towns as the French left side were escaped from the scene and Tallard was captured. The simplicity of this battle would go into the most easiest Allied win in the War of the Succession: superior tactics and engagements guaranteed the victory. But is it that simple? If we dug into the historical literature we would find interesting and questionable scenes. The first is the move on Blenheim – the Allied strike force was stopped and lured more and more troops from each side without any result. If we check the Allied plans we would say that Marlborough failed at his first objective and have to improvise on the field. His actions gave them the victory later as the French centre collapsed. But there are questions about that: what if Marlborough used “magic” in order to ensure the French reinforcements go to Blenheim itself? In magic I would refer “strategic planning” or a fake attack, although many lives lost near the town Marlborough gained the upper hand! Going back to the first illustration we can see why many historian call him a genius: he used his forces to lure the enemy into the town and later he pulled out a surprise attack on the French centre with cavalry and infantry as well. Using the cavalry to deliver a deceive blow refers to the famous Swedish horse usage and the “reforms” of Gustavus Adolphus. Marlborough had two big advantages. First he scouted the enemies camp and memorized the battlefield relative easily. He also had Austrian officers helping him about the terrain – those who lost against a French a year ago not far from there. From that knowledge he could make an easy but atypical battle plan by crushing the French line in half and made fake attacks on the towns. The second one is simply strategy and communication. He and Eugene could work together relatively well by giving separate battles to every commander (they had to fight their own part of the bigger battle!). On the other side the defensive French-Bavarian commanders had isolated command posts and disputes about the battle. For example the French general in Blenheim ordered the reserves into the town without Tallard’s permission; Tallard did not get Marsin’s reserving cavalry in the counter push and so on. The historians tend to vádolni Tallard on losing the battle because of the numerical fölény and the terrain positions using the earlier examples. On the psychological side the Allied troops had high morale and faith in the commander as Churchill pointed out. The French’s morale could be less or more (without enough sources we cannot be sure), their army were unbeatable in that period and this was their first defeat! Sources reported that after the fall of Blenheim (late in the night) the French soldiers were crying as they handed their flag to the British officers. The famous dispatch about the battle was wrote on the side of a hotel check. The classy message was this: “I have not time to say more but to beg you will give my duty to the Queen, and let her know her Army has had a glorious victory”. We should see that he did not informed the Queen herself but his wife about the battle. 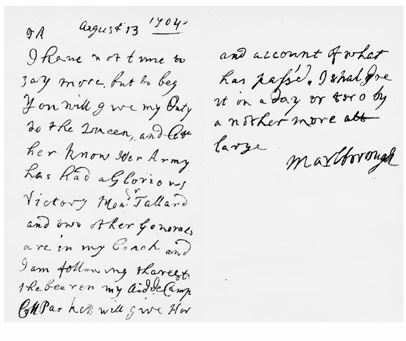 The famous letter he wrote about the situation is also worth mentioning. After the battle Vienna was saved from direct Bavarian assault and kept the Austrian allies in the war for long time. Marlborough had achieved his goal: saved his allies and delivered a fatal blow to the French-Bavarian forces. The necessity of battle proved its valuable and became an example to the rest of the conflict. The casualties were raised high: the Allied losses amounted to nearly twelve thousand, but the French army suffered a huge blow with almost thirty-nine thousand lost. In the War of the Spanish Succession Blenheim was a turning point. Before that it seemed the French already won the war: Vienna was under threat and the Anglo-Dutch forces could not made any progress in Flanders. Marlborough had to take the risk and offered a battle the unbeaten French troops in Germany and he won. In this atypical battle he pulled out an extremely simple, elegant and magnificent plan to crush the French-Bavarian forces. With his cooperation with Eugene he managed to play with the enemy’s mind and gained strategic advantage where he wanted. By sacrificing the element of surprise with the attack on Blenheim he made the French commanders to act and they fallen into his trap. As the French general Tallard was captured and the last battalions of his troops surrendered in Blenheim the fate of Europe had changed – but the war was not about to end. Churchill, Winston S: Marlborough. His Life and Times. London, 1947. Falkner, James: Blenheim, 1704. Battle Story. Stroud, 2014. Haythornthwaite, Philip J: Invincible Generals. Firebird Books, 1991. Holmes, Richard: Marlborough. England’s Fragile Genius. London, 2008. MacFarlane, Charles: A life of Marlborough. London, 1852. Périni, Édouard Hardÿ de: Les armées sous l’ancien régime, 1700 à 1789. Saintsbury, George: Marlborough. New York, 1886.